Along with my partner, I own and run about 20-25 web sites. Some of the web sites are very active and pay a good chunk of my bills; other sites are frequented only by a random search engine bot, coming to see if anything has changed on the site. The big question is, with so many websites already on the go, why another one? Why Davemanuel.com? 1. Money. I'm a competitive guy. When I hear that other personal blogs such as Johnchow.com and shoemoney.com are making in excess of $10k, I get interested. I mean, I love to write, and I believe that the topics that I write about are easily monetized. So why not? I mean, even 10% of what they earn would be a lot of money. But I'm not interested in just 10%. I'm interested in catching up and eventually beating them. Why not? I love to write, I type like the wind, and I always have topics to write about. Plus my partner and I market web sites for a living, so why not. 2. The challenge. It's a pretty cool challenge saying "I'm going to take a website with absolutely no traffic and make it a bonafide money-maker over the course of a year." It's a strange world that we live in when a personal website has the potential to make more than an educated doctor or lawyer. 3. Inspiration. Everyone knows that I develop and run websites for a living. Everyone always asks me how I do it, and how they can get started. I want to be able to show this website to people and say "Here you go. This is how you do it." 4. It's fun. I mean, this website already gets over 300 unique visitors per day. 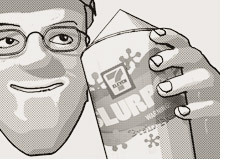 That's 300 DIFFERENT people a day seeing a cartoon figure of me holding a slurpee. People from Germany, New York, Finland .. all visiting a site called davemanuel.com. To me, that's pretty funny. 5. Experimentation will benefit other websites. This site is the ultimate monetization experiment. We nail down how to make money with this site, and we can repeat it in other industries. If this site can make money, we can get other websites going using the same principles. First the traffic, then the monetization. 6. Raising our profile. Eventually, when we have thousands of people reading this website per day, this will only help to raise the profile of our other websites. You never know; a potential buyer for one of our websites may be a reader of this site. That's about all I can think of. To be honest, money is not the biggest motivator for me doing this site. It's the challenge. The bar has been set high in terms of other blogs, and how much traffic and $ they make. Some people would say, oh you should just be happy to make what you make and that's it. Forget that. If they can make $12k per month US, we can too. That is the exact same attitude you should take in creating your own site. Set your sights high. This is one of the best businesses you can possibly run. We pay $9 per year for the domain, $10 / month for the web site hosting, and everything else is pure profit. That's a pretty crazy business model.